this means raya is about 2 months+ away! oh oh! i haven't ganti last year's puasa. i was pregnant last year and i missed X number of days of puasa last year. Gaaaah! Speaking of raya, I am sure most people have sent their materials to the tailors by now. I haven't! In fact, I haven't even decided what colour to be this year's theme colour. The other day my mum suggested a aprticular colour. Hubby already has a baju melayu in that colour so he's safe. Pfft. This means I need to find a baju for me and Babycakes. Shopping, yeayyy! This year being the 1st raya as a Mummy, of course I am super excited. 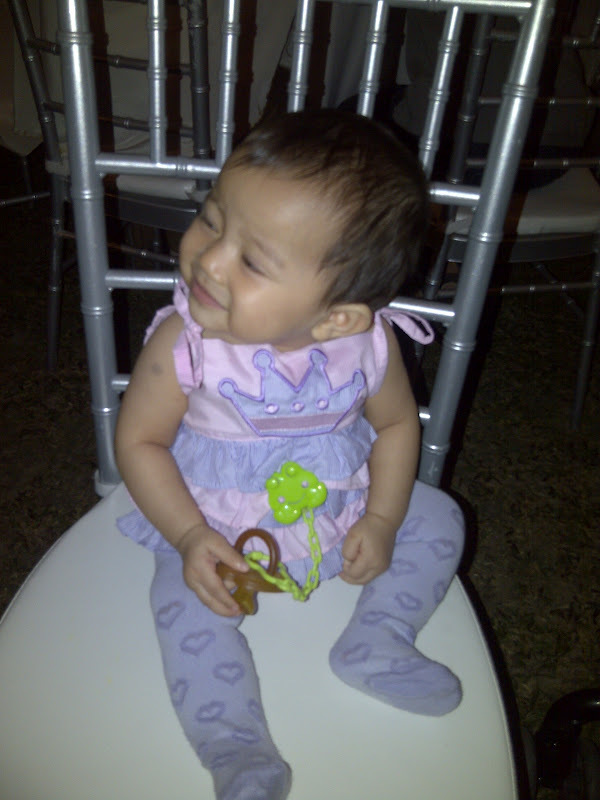 Babycakes will be 11months during raya so it'll be fun to dress her up and she may be walking by then. Or at least scrambling. I can imagine her in pretty gowns and cutesy baju kurung. Would you believe me that Babycakes already has not one but TWO pairs of baju kurung already? Yes, I already bought them for her. One was bought in April and another one I bought in May. Crazy huh? Puasa is not even here yet but she already has her baju. And one of the baju kurung has lots and lots of maniks on it, I kid you not. But they're cheap so I HAD to buy it. Come puasa time, the price will surely double, I betcha! Kalah Mummy nanti. But the two baju kurungs are not that particular colour. I want to have a matchy-matchy baju kurung with her to be worn on the 1st day of raya but no tailors are gonna accept it now. *knocks on head* I have a pair of kain which I asked my SIL to buy in Bandung but looks like the kain will have to be kept for raya haji or some other occasion. It's not even that colour anyway. The issue now is, where can I find a matching baju kurung for me and Babycakes? I want us to wear the same baju! As for the 2nd and 3rd and subsequent days of raya, we will be wearing matching colours. This means I now need to find another one to match her manik2 baju kurung because I already found (and bought) one to match her other baju kurung so at least I'm safe there. It's better to buy early because prices will soar come puasa time. I even left my card at the boutique so that they can inform me once the mummy & baby baju has arrived. I hope they're pretty and 1st raya-worthy. And I hope the prices are within my budget. Hmm...it just doesn't sound right, does it? 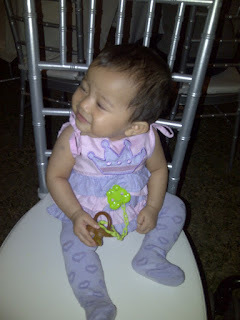 Mummy has to match Babycakes' baju, and not the other way round? It's pretty clear who's the boss now huh?